Post written by Jun-Won Chung from the Divison of Gastroenterology, Department of Internal Medicine, Gachon University, Gil Medical Center, Incheon, South Korea. Endoscopy is performed with air insufflation and is usually associated with abdominal pain. It is well recognized that carbon dioxide (CO2) is absorbed more quickly into the body than air; however, to date, few studies have investigated the use of CO2 insufflation during consecutive esophagogastroduodenoscopy and colonoscopy (CEC). We believe that this work will be of particular interest to readers because we have explored the utility of carbon dioxide (CO2) insufflation during CEC. We found that compared to air insufflation, CO2 insufflation reduced abdominal pain and distension after CEC. 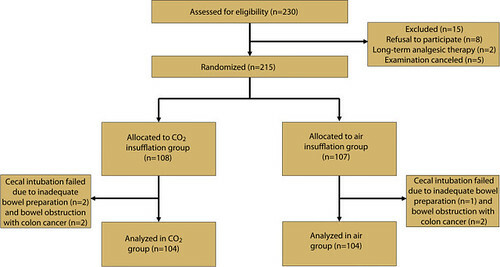 Previous randomized controlled trials showed that CO2 insufflation decreased GI endoscopy-related abdominal pain and discomfort compared to air insufflation. To date, a number of studies have demonstrated that CO2 insufflation is safe and reduces the incidence of adverse events such as pneumoperitoneum, mediastinal emphysema, and Mallory-Weiss tear. The majority of CO2 insufflation studies were performed on patients undergoing endoscopies with longer procedure times such as endoscopic submucosal dissection (ESD), endoscopic retrograde cholangiopancreatography (ERCP), double-balloon enteroscopy, and colonoscopy. CEC requires a longer procedure time than colonoscopy, and, as such, can lead to more gas insufflation, abdominal distension, and abdominal pain than colonoscopy alone. A PubMed search yielded few published studies comparing CO2 and air insufflation during CEC. Thus, this study evaluated the efficacy of CO2 insufflation in moderate sedation patients undergoing CEC. Figure 1. Study recruitment flow diagram. Abdominal pain on the VAS in the CO2 group and air group were 13.8 and 20.1, 1 hour after CEC (P = .010); 8.3 and 12.5, 3 hours after CEC (P = .056); 3.5 and 5.3, 6 hours after CEC (P = .246); and 1.8 and 3.4, 1 day after CEC (P = .192). The dose of sedative administered, analgesic usage, PDR, ADR, and the adverse events were not statistically different between the groups. However, the increase in abdominal circumference was significantly higher in the air group than in the CO2 group. We clearly demonstrated the clinical effectiveness of CO2 insufflation during CEC in patients under moderate sedation. In conclusion, CO2 insufflation leads to a significant reduction in procedure-related pain. Based on our results and other recent studies, we recommend that CO2 insufflation be routinely used during CEC to reduce pain. Find the article abstract here. The information presented in Endoscopedia reflects the opinions of the authors and does not represent the position of the American Society for Gastrointestinal Endoscopy (ASGE). ASGE expressly disclaims any warranties or guarantees, expressed or implied, and is not liable for damages of any kind in connection with the material, information, or procedures set forth. Submit an article to GIE! Submit an article to VideoGIE!